1969, SOFT TISSUE SARCOMAS, BREAST CANCER- A FAMILY SYNDROME? In 1969, Dr. Joseph Fraumeni and Dr. Frederick Li were working at the National Institutes of Health when they noticed four families with two children who had sarcomas. Three families had two siblings, one family had two cousins with sarcomas. Beyond that rare occurrence, 3 of the mothers of the children had breast cancer. Further study found 24 kindreds with lots of cancer, which they labelled SBLA(Sarcoma, Breast, Leukemia, Adrenal) Syndrome, now known as Li-Fraumeni Syndrome. SARCOMAS MAKE UP 25% OF ALL LFS TUMORS. Sarcomas are considered rare- which is to say they make up less than 1% of all cancers in the general population. Sarcomas make up about 25% of all LFS tumors- but everything, including rarity is relative in a rare cancer syndrome. Unlike most other tumor types- sarcoma is not limited to one region of the body. This is partially what makes sarcomas so difficult to recognize, diagnose, screen, and treat. They can be hard, soft, painful, pain-free, slow growing or really aggressive. You can find sarcomas in bones, muscles, fat, or connective tissue(blood vessels, nerves, cartilage). They can appear at any age. 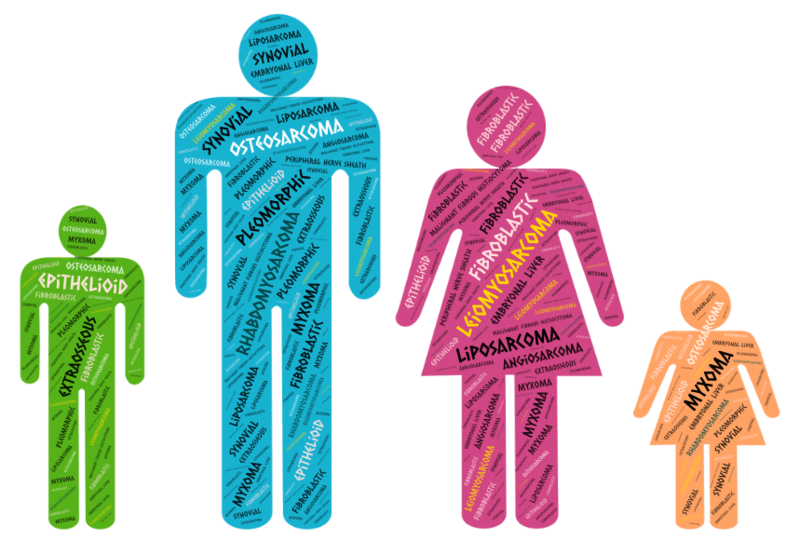 THERE ARE OVER 50 TYPES OF SARCOMA, MANY WITH SUBTYPES. There are over 50 types of sarcoma. Many sarcomas are identified by where they are found or the cell type- Rhabdomyosarcoma(striated muscle), Liposarcoma(fatty tissue- often mistaken for cysts), Leiomyosarcoma(smooth muscle), Osteosarcoma(bone), OR chondrosarcoma(cartilage). You may have had or known someone with a sarcoma if you recognize the terms: Malignant Fibrohistiocytoma(sometimes referred to as pleomorphic sarcoma), Myxoma, or Gastrointestinal Stromal Tumor- also sarcomas. This makes sarcomas difficult to diagnose. Consulting with sarcoma specialists and getting second opinions for diagnosis and treatment are encouraged. 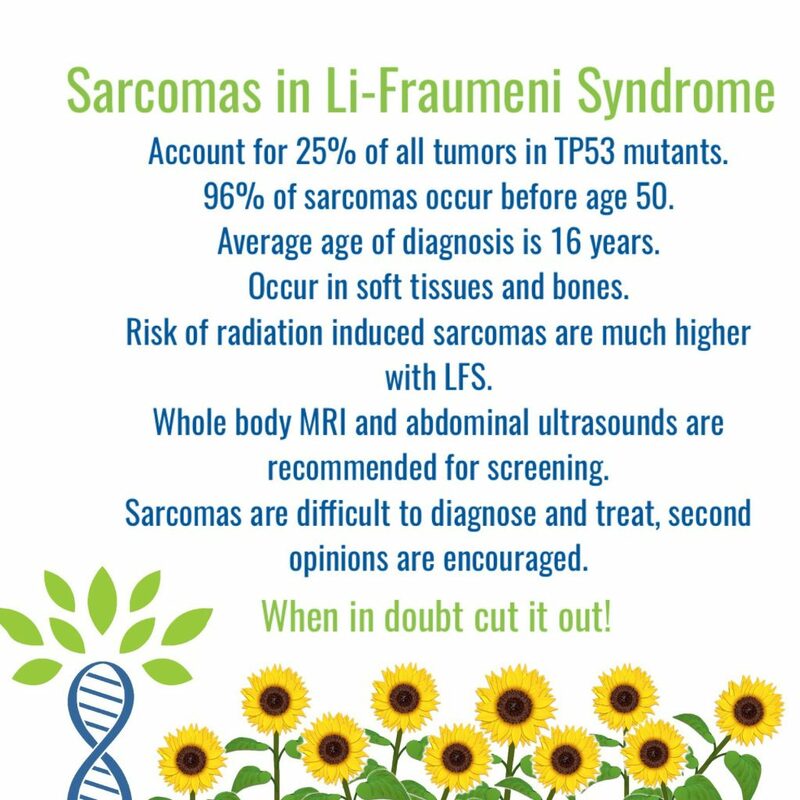 96% of LFS SARCOMAS DEVELOP BEFORE AGE 50. The average age of sarcoma diagnosis in LFS is 16 years old. Certain sarcomas are seen more frequently at certain age ranges, although they can and do appear anywhere at any age. For example, Rhabdomyosarcomas are diagnosed more often at age 5 and under, Osteosarcomas are more often seen at ages 20 and under and liposarcomas and leiomyosarcomas are both more frequently seen after age 20. RISK OF RADIATION INDUCED SARCOMAS IS MUCH HIGHER IN LFS. LFS mutants have radiation sensitivity. This means that radiation can cause damage to our genes that mutant p53 cannot fix. To avoid genotoxic damage, we try to avoid radiation where possible. This can be problematic for screening, diagnosis and treatment. Scans such as X-ray and CT use different amounts of radiation, but can see certain tissues better than MRI or ultrasound, which don’t use radiation. Radiation therapy, which is a standard of care for many cancers, is problematic with LFS. Sarcomas in general are tough to treat, so we try to avoid radiation if we can, but we have to treat the cancer we have with whatever arsenal is at our disposal. 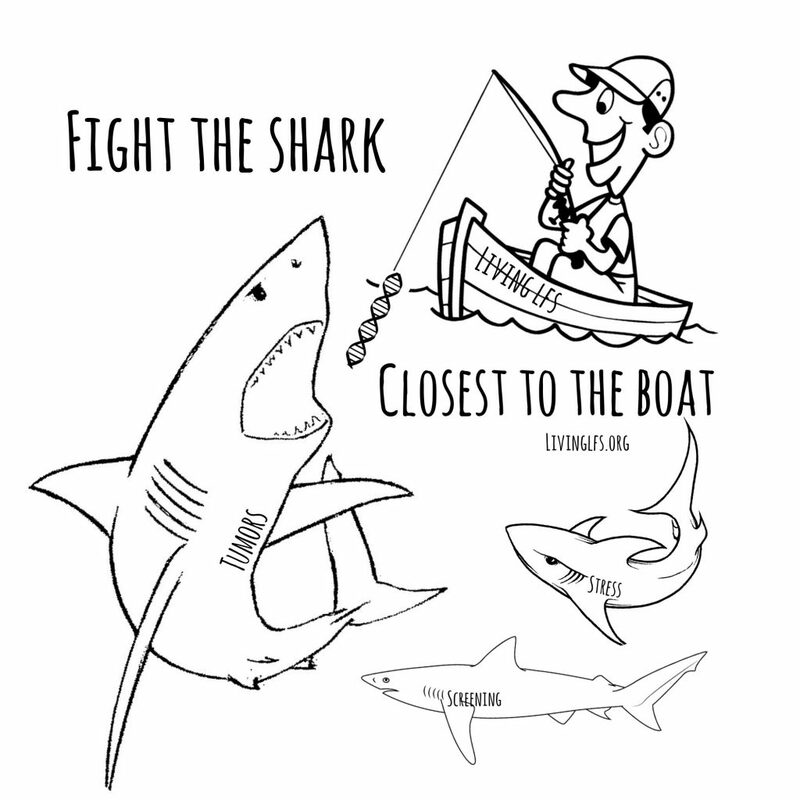 As we say in our support group- You have to fight the shark closest to the boat. WHOLE BODY MRI, SCREENING AND DOUBT. Recently there is more support scientifically for using Whole Body MRI(WB-MRI) to screen for tumors in LFS. Although this method can be cumbersome and expensive- there are not many alternatives to sufficiently cover the whole body risk of sarcoma without radiation exposure. There is the risk of false positives, stress and more tests. There is also the chance tumors will be caught early enough to get out before they metastasize. Another one of our favorite sayings in the support group is When in doubt, cut it out. We are a lumpy, bumpy bunch. We grow weird. Not everything is cancer. Sometimes it’s easier to cut out the little lumps than worry about what they might become. 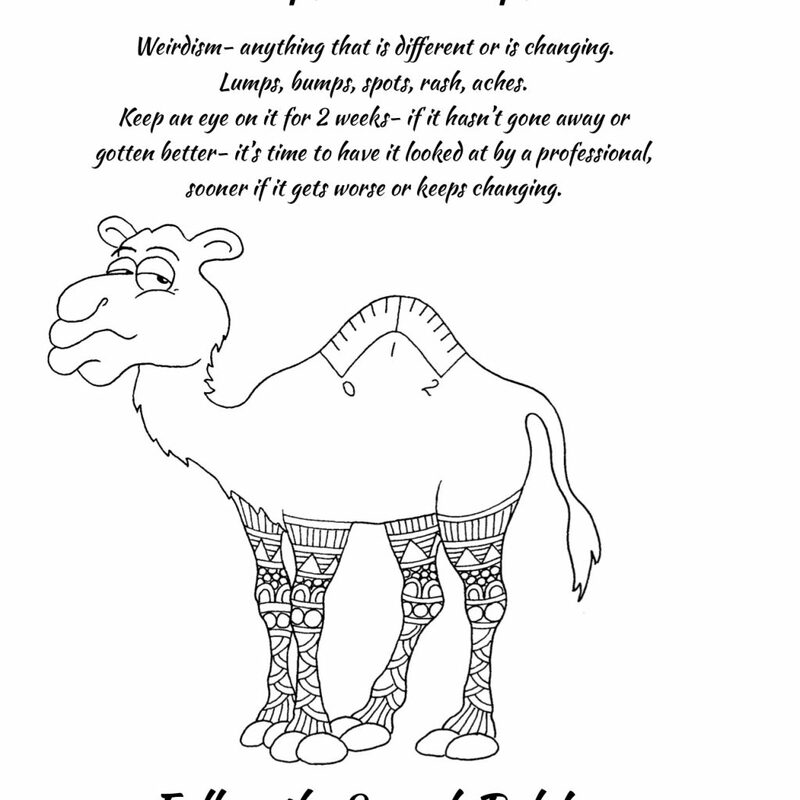 We use the 2-week rule as an unofficial time frame to know when something should be looked at. The other recommendation from those with experience is to get second opinions, on pathology, on treatment, on everything sarcoma, from sarcoma specialists. Second opinions can help you make the best decision for you.